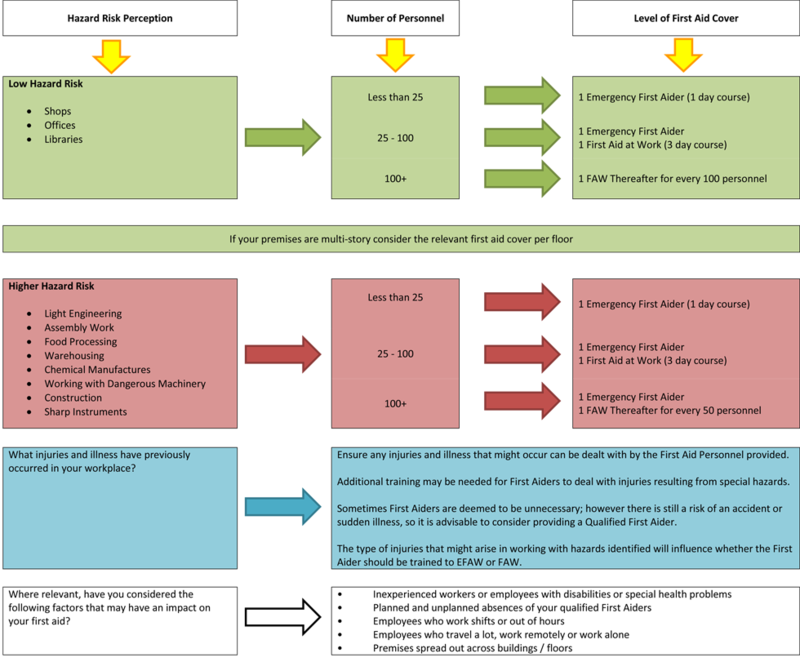 The flow chart below is derived from the revised HSE 2009 First Aid Risk Assessment and should be used in conjunction with Employers HSE First Aid Requirements (HSE First Aid at Work Regulations 1981); when establishing the risk assessment, the degree of hazards associated with your work activities in relation to the workforce. Currently the Health and Safety (First Aid) Regulations 1981 require employers to provide adequate and appropriate equipment, facilities and personnel to ensure their employees receive immediate attention if they are injured or taken ill at work. It is the responsibility of the employer to decide upon their company’s level of risk using the First Aid Needs. As quick reference when establishing the risk and potential hazards with the recommended level of first aid cover use this flow chart. With an increase in risk, the requirement of First Aid and knowledge increases.